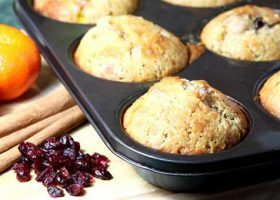 This recipe uses frozen soft fruit, so that they do not break up when being mixed into the muffins but remain whole. Great for breakfast, coffee or just as a snack. Cooks tips Best eaten on day of baking but can be warmed before serving on following day ie for breakfast. Preheat oven to Gas Mark 5/190C. Combine sugar, butter, eggs, yogurt and cordial in a bowl. Sieve flour and baking powder, add to liquid and mix thoroughly. Carefully fold in fruits, trying not to break them up. Spoon into 12 greased muffin pans (or pans lined with paper cases). Bake at gas 5/190C for 30 - 35 minutes, turn tray round half way through cooking. Dust with icing sugar and serve warm.